I thought cloth diapering was an inherently frugal activity, but my eyes have been opened. For some people, cloth diapering might be even more expensive than disposable diapering! But if you avoid just a few pitfalls, cloth diapering will remain a frugal strategy. The cost of disposable diapers are pretty much all up front: the retail cost of the diapers. Frugality in disposable diapering is all about finding the least expensive diapers that work for your baby and not being wasteful. With cloth diapering, the costs are more numerous and therefore there are more ways to spend more or less money. The costs include: the cost of the diapers, additional power and water usage to wash them, extra cleaning products, and perhaps some accessories like a diaper sprayer. (I’m not including costs such as wipes, creams, and pails/bags because they exist for both cloth and disposable diapers.) The total cost of cloth diapering is dominated by the price of the diapers themselves as the ongoing costs for cloth diapering are usually quite minimal, e.g., the average household’s water usage would only increase by 5%. In every example calculation I’ve seen (some hypothetical, some based on real usage), cloth diapering is more expensive than disposable diapering at first (buying the diapers and other supplies), but within the first year the ongoing costs of disposable diapering overtakes the cost of cloth. Extrapolate this to a multi-year diapering period for one child and then multiple children, and cloth diapering seems to be the hands-down frugal choice – and it usually is. But my cloth diapering practice over the last 8 months and my involvement with a cloth diapering Facebook group has shown me that there is an un-frugal side to cloth diapering! Frugality is not necessarily the driving motivation for cloth diapering for every parent, but in those cases I think it should at least be appreciated as a side benefit. Below are three ways that cloth diapering can become an un-frugal pursuit and how to avoid them. Did you know that there is a robust and popular market for used cloth diapers? As someone who is a bit squeamish about used clothes, at first I couldn’t believe that anyone would use a product that had been pooped on by another person. But this market exists! You can take advantage of this market at the buy, the sell, or both, but don’t make the mistake of ignoring it completely! As the initial cost of the diapers is the largest component of the overall cost of cloth diapering, it’s amazingly beneficial that both getting a discount on the initial buy and recouping a large fraction of your initial investment are possible. If you do both, your eventual cost might be much less than 50% of the new retail cost of the diapers, depending on how much wear you put on them. In fact, we purchased approximately 1/3 of the diapers we own secondhand. I was happy to get like-new diapers for a discount, and I plan to sell all our diapers when our family is done with them. Diapers that are in good condition sell for approximately 50% of retail, and the better the condition the higher a price you can command for them. Imagine trying to sell a used disposable diaper for 50% of what you paid! Donating your used cloth diapers is another great option – helping another family practice frugality! This next un-frugal cloth diapering practice is one I observed in my Facebook group. How shall I put this? Some people are very enthusiastic about cloth diapers. Cloth diapering is more of a hobby than simply a way to manage a baby’s waste. There is a community that they like to be involved with. Some of those hobbyists go overboard with the number of diapers that they buy. I have seen people boast about cloth diaper “stashes” that number in the hundreds of diapers! That’s more diapers than a child could wear in a month! (And trust me, you do not want to go a month between washes!) For comparison, we own 18 cloth diapers, and that’s more than enough to get us through our two-day wash cycle. I recognize that our stash size is on the smaller end and some people might want to wash less frequently than we do or have multiple children in diapers, so I’m not saying that everyone needs to own less than 20 cloth diapers. My point here is that to keep cloth diapering frugal you should limit your stash size to the number of diapers you can use in a reasonable period of time. Remember, the diapers themselves are the most expensive aspect of cloth diapering. If you are a collector of attractive patterns, adopt a “one in one out” rule, selling one diaper for every diaper you buy. I’ve noticed that people who cloth diaper also tend to use disposable diapers from time to time (unless they are cloth diapering for health reasons). Usually, switching to disposables is situationally triggered, such as overnight, when using childcare, while sick, or when stripping cloth diapers. We use disposable diapers while traveling and to clear up diaper rash. Every time you buy disposable diapers, you’re shrinking the frugal impact of cloth diapering. If it’s only occasional, you’re still going to come out way ahead by cloth diapering most of the time. So the pitfall to avoid is using disposable diapers so much that your cost savings are eliminated. You certainly don’t want to bear all the costs of cloth diapering and all the costs of disposable diapering! That calculation is going to be different for every family, but you don’t want to get anywhere close to it because cloth diapering is a bit more work than disposable diapering. I really like cloth diapering, so I’m eager to return to it every time we put DPR in disposables for a few days. 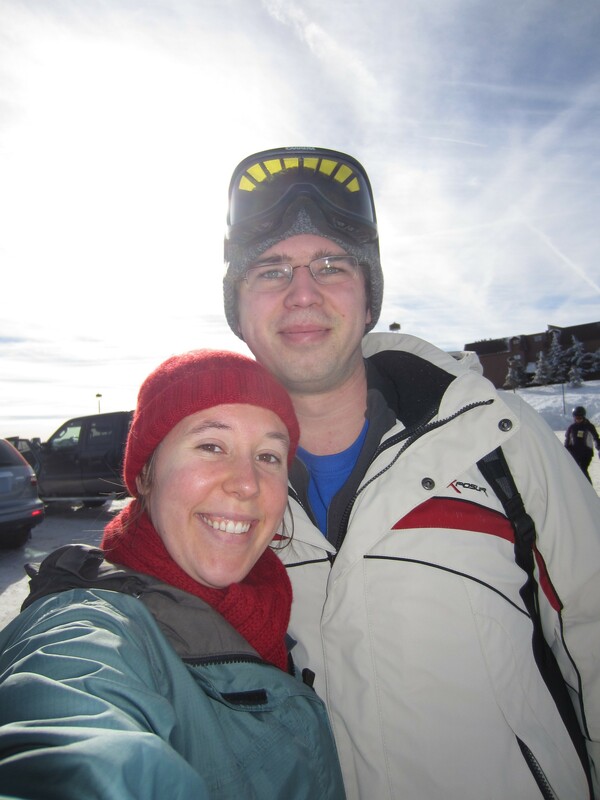 Of course, you don’t realize savings from frugal practices if you don’t actually practice them! 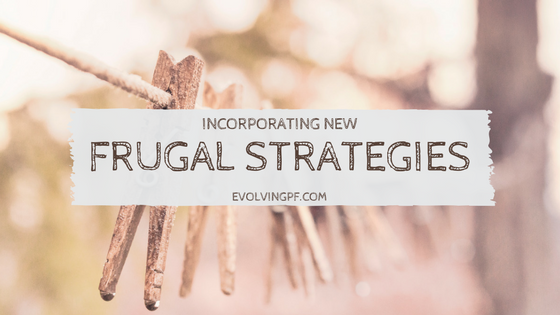 How have you seen frugal strategies become un-frugal? 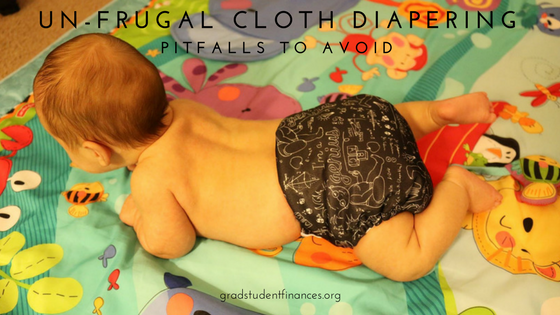 4 Responses to "Un-Frugal Cloth Diapering Pitfalls to Avoid"
The biggest savings from cloth diapers for us was fewer trips to Target which led to fewer impulse purchases at Target. I think people discount how much of a pain – and possibly temptation – it is to regularly buy diapers! I was Googling for free trials yesterday (of just random things, wasn’t looking for anything in particular) and I did find quite a few free trials to diaper subscriptions. Most of them were pay for shipping for a sample of 10 diapers or something. That would be a good way to score a few freebies! Very useful if you only have occasional need for disposable diapers.